Highlights of our collection on the Google Cultural Institute. Google’s Cultural Institute began in 2011 as the Google Art Project. It is an effort to make important cultural material available and accessible to everyone and to digitally preserve it to educate and inspire future generations. As partner of the program, the museum joins over 670 other institutions sharing highlights from our collection on the platform as part of a global repository of human history. You can explore the Institute’s collections on their website or through the Arts and Culture app (from the Google Play Store or iTunes store). 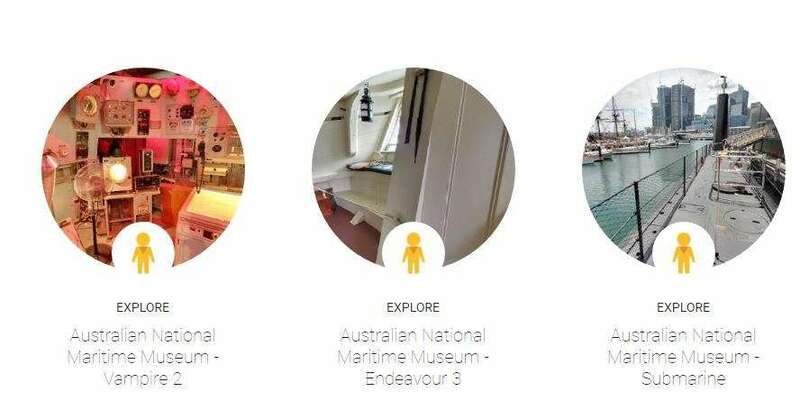 You can now virtually sightsee the permanent galleries and several of our historic vessels through Google Street View on the Arts and Culture platform (and Google maps). The Google team captured over 500 panoramas of our galleries and precinct. This high-resolution imagery has been seamlessly stitched together to guide you through the museum. Explore our Navigators gallery. To find out more about an object simply click on the collection items in the tray at the bottom of the screen or hover your mouse over the item to select it (as seen with the globe in this example). Explore our online collection in Street View by clicking the collection items in the tray on the bottom of the screen, or by clicking on the highlighted item directly on the Street View. You can spend an afternoon virtually walking through our galleries, casually reading the object labels…from the comfort of your favourite smart device. Our Navigators and Watermarks galleries, in particular, have many treasures waiting to be discovered. From our page Arts and Cultural Institute page you can step inside HMB Endeavour, HMAS Vampire and HMAS Onslow. 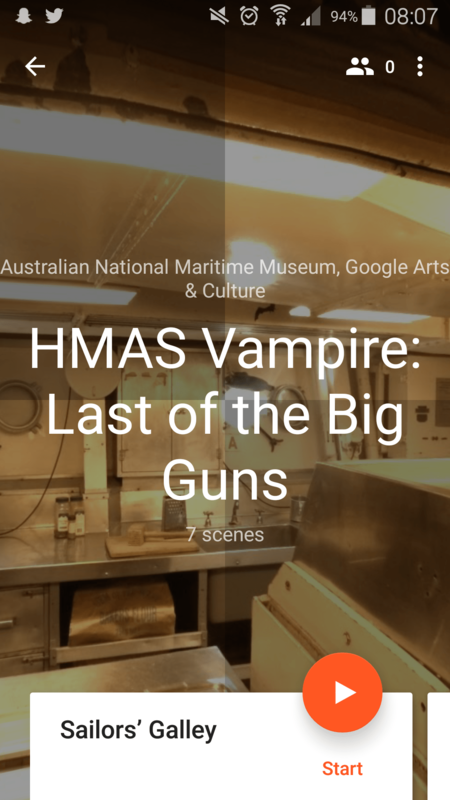 HMB Endeavour, HMAS Vampire, HMAS Advance and top deck of HMAS Onslow were also captured for Street View – this was a world first for Google to digitise heritage vessels while the vessels are in the water. Indeed, the slight motion and rocking of the vessels (especially HMB Endeavour) proved a challenge for the Google team when capturing the imagery. The Art Camera was developed by Google to capture beauty and power of art in all its details. The camera captures a gigapixel image of the artwork in detail greater than what meets your eye when standing in front of an artwork in person. With the Art Camera you can see very brush stroke, crack in the paint and smudge by the artist’s hand – with incredible clarity. 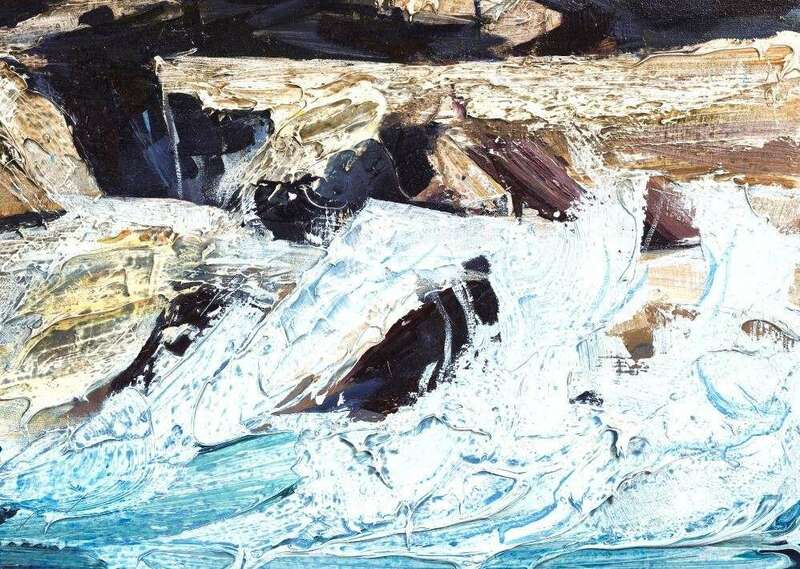 Extremely close detail of North by Neil Frazer. ANMM Collection. We have launched over 25 new Art Camera objects on our online collection. These include traditional oil paintings of tallships, contemporary Indigenous Saltwater Barks, modern landscapes and early charts of the Australian coastline. The bark SR Bearse captured by the Art Camera. You can zoom in to see the layers of oil paint. Sydney in Watercolour is our latest exhibition on the Institute. It explores Sydney Harbour as it was rendered by Muriel Binney in 1907. These four hand painted watercolours were captured by the Art Camera and show a harbour of wooden boats and tallships, both at work and at leisure. Each panel is over five meters long in person, making it a difficult work to display in our galleries but it’s delicate detail excel in the online exhibition – be sure to click and drag the panoramas around to see all the delightful details. Sydney in Watercolour explores the delicate watercolour paintings of Muriel Binney. ANMM Collection. We’re also proud to announce our first Google Expedition was released this week. Expeditions are Virtual Reality (VR) guided tours and classroom lessons. Teachers and students download the Expeditions app (via the Google Play Store or iTunes) onto a smart device and then undertake a virtual excursion using 360 imagery and/or Google Cardboard VR. For HMAS Vampire, teachers access questions, notes and a tour of the Destroyer, covering what life was like for the crew onboard. Students are guided through the ship by their teachers in less than an hour. This is a fantastic initiative for students were can’t physically visit HMAS Vampire and the Expedition accessible worldwide. 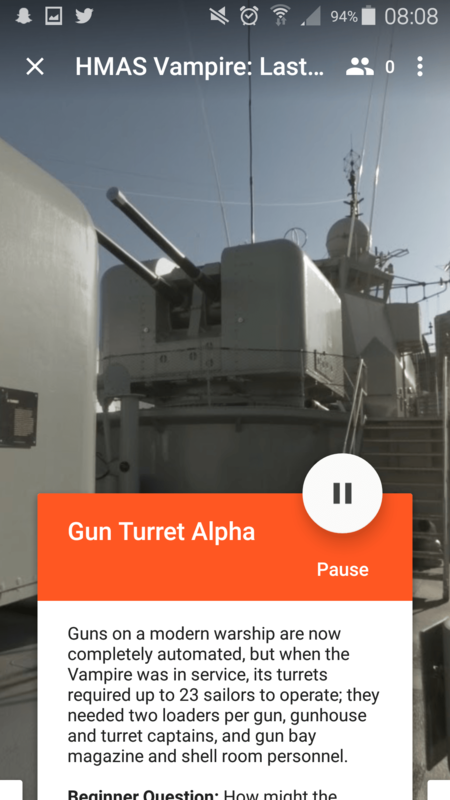 Virtual excursions to HMAS Vampire. Google is constantly expanding their digital cultural programs and the museum hopes to develop VR audio exhibitions of several collection objects in the near future (stay tuned! ).